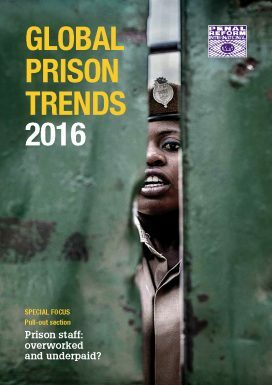 This is the second annual edition in our Global Prison Trends series, describing key global trends in the use and practice of imprisonment and the pressing challenges facing states that wish to organise their penitentiary systems in accordance with international norms and standards. Topics include for example: developments in international criminal justice policy; notable changes to policy at the national level; prison population trends; prison management issues (eg. security and violence, radicalisation, corrections in fragile and conflict states, corruption) and new technologies. The 2016 also has a new section on the provision of food in prisons, with some representative data on food expenditure. Significant international developments and recent research projects are highlighted throughout. The report also includes a Special Focus pull-out section – Prison staff: Overworked and underpaid? Working in a prison requires specific skills, but prison staff can be poorly paid, under‑trained and experience high levels of work‑related stress and violence. This special feature provides a global perspective on prison staff recruitment, pay and conditions, professional training, and issues relating to their health, safety and well‑being.